Here is the 2016 Calgary Flames Qualifying Tournament in its entirety. 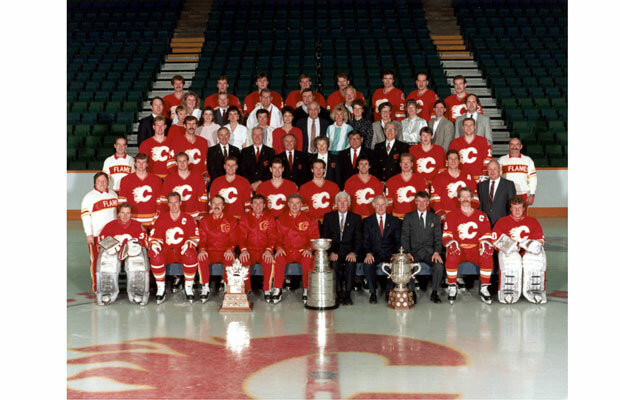 The top-seeded ’88-’89 Calgary Flames breezed through the qualifying tournament without losing a game. They easily handled the seventh-seeded ’94-’95 Calgary Flames in the Final. In Game 1, the ’88-’89 Flames shutout the ’94-’95 Flames 5-0 as goaltender Mike Vernon stopped all 31 shots against. Defenseman Al MacInnis led the way with two goals and two assists in the win. The ’88-’89 Flames then scored three goals in the first period of Game 2 as they went on to hang on late to a 5-4 win. Both Joe Mullen and Gary Roberts tallied two goals and an assist for the ’88-’89 Flames as they took a 2-0 series lead. In Game 3, the ’94-’95 Flames broke out to a 2-0 lead in the second period, but by the end of that period, they trailed 3-2. The ’88-’89 Flames won 5-2 with Joe Nieuwendyk leading the way offensively with two goals and two assists. They finished off the sweep with a 5-1 win in Game 4. Nieuwendyk shined again as he scored twice and added an assist while MacInnis also pitched in with two goals. The ’88-’89 Flames will now be making their third trip out of three years and will try to make up for a disappointing second appearance after being the runner up in the inaugural tournament. Up next is the 2016 Dallas Stars Qualifying Tournament! This entry was posted in Qualifying Tournament, Ultimate NHL Playoff and tagged Al MacInnis, Calgary Flames, Gary Roberts, Hakan Loob, Joe Mullen, Joe Nieuwendyk, Mike Vernon, Qualifying Tournament, Trevor Kidd, Ultimate NHL Playoff. Bookmark the permalink.